Howdy, Austin! There’s a new dog in town. We’re proud to bring the New York City flavor to 3rd and Congress Avenue in downtown Austin with Schaller’s Stube first food truck now open and serving daily. 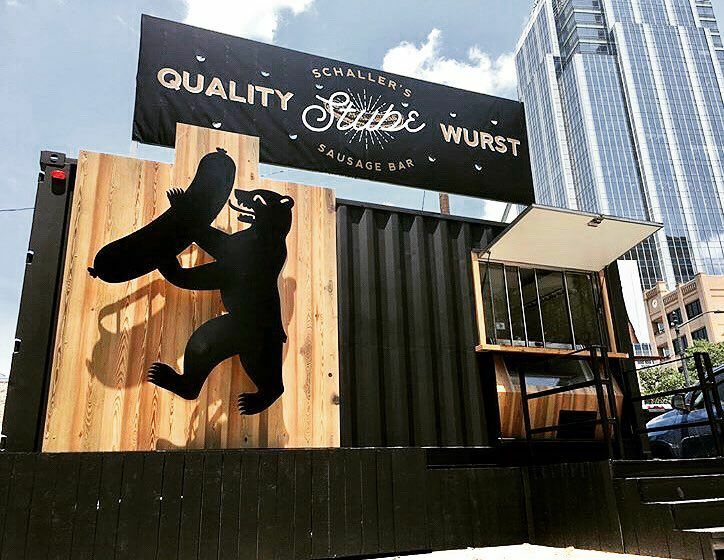 Come down to get a bite of all the favorites from Schaller’s Stube in New York alongside a few Texas-inspired recipes like our cheddar brat corndog (best dipped in our famous Sweet & Spicy Bavarian Mustard.) Enjoy your dog with a pretzel on the side and a selection of local Texas brews and refreshments. We’ve also included three special vegan sausage options from BeyondMeat. Try these delicious vegan sausages in the “Sweet Sicilian”, “Bahn-Meat”, and the “Beyond Classic” or sub them into any menu item that strikes you. Join us daily from 11 a.m. to 3 p.m. (or until sold out,) and from 8 p.m. to 3 a.m. Friday and Saturday. Read more about the expansion west in our feature in Eater Austin.